Due to the nature of the products we produce, we are aware we have the potential to negatively impact the environment. In an attempt to counteract this we have put a lot of effort into choosing materials and manufacturing processes that minimise the impact. As much as we try to source our materials responsibly and are careful to take notice of who we are in business with we are aware that simply reducing our damage is not enough to truly offset our potential impact. So we have also teamed up with reforestation charities so that for every custom stamp sold a tree is planted in an area affected by deforestation. Starting from 2018 our charity of choice is ‘Trees for the Future’. 1. We use environmentally sourced oak from ‘G&S Timber’in the production of our handles. Having absorbed Carbon Dioxide throughout its life, an oak tree has already repaid its debt to the environment before it is felled. In addition to this, oak has a longevity many other materials cannot match. 2. The rubber we use is natural eco rubber that we get from Ready For Laser. There are much cheaper rubbers out there but this is a very high-end rubber that gives highly detailed impressions and has the best eco-credentials of any we’ve found so what’s not to like! It also gives our stamps their distinctive green colour as another little bonus. 3. Instructions scroll is 100% recycled. 4. Our packaging is 100% plastic free. Even down to the biodegradable (plastic looking) sticker we seal the boxes with. 5. We acknowledge that the ink pad casings are made from plastic as an industry standard and there’s not a lot we can do about it. When used alongside Re-inkers though, you never have to throw them away! We are confident that one ink pad and Re-inker can achieve 10’s of thousands of impressions and when you finish your bottle of reinker, just clean it and either reuse it or recycle it. We are based at StudioGreen in Herne Hill London which is a multi-function creative studio and members club facility, for artists, designers and craft makers. It is situated in a series of railway arches built using 95% reclaimed materials (pretty remarkable and unheard of in London!). Our energy supplier is Good Energy who source their power from 100% renewable sources that are generated in the UK. This means that because our heating comes from efficient electric heaters, our workshop and office is run completely fossil fuel free. 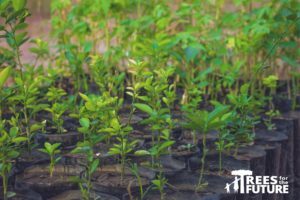 Please Note: The number of trees planted displayed on our website reflects the total number of qualifying products sold and as such may include the current months sales which will not be reflected in the fundraiser until the following quarter.